﻿The Annual Neighborhood Garage Tour is Off-Leash Area's grass-roots, community-building program that each fall brings professional, family friendly contemporary dance & theater directly into neighborhoods across the Twin Cities & 7-county area. It all began in 2003 when co-directors Jennifer and Paul stepped into the garage of their new home in South Minneapolis and had their Mickey Rooney Judy Garland moment, and thought - "Wow! We could do shows in here!" By being invited by homeowners to bring our work directly into neighborhoods, and with our "suggested donation" admission policy, we overcome financial and geographic barriers to accessing our work, and more and more Minnesotans can participate in the arts. So far nearly 3,500 Minnesotans have been to the Annual Neighborhood Garage Tours! 1. Make a reservation in advance for the garage you want to go to. 2. Make a donation at the door - only $5 to $20 per person. You choose the amount you can afford. 3. 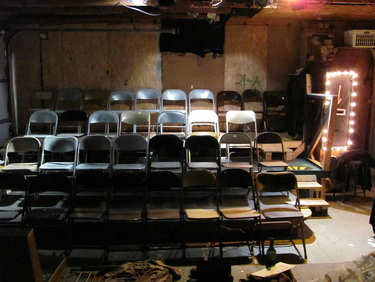 See a great show - in a garage! 4. Join your friends, family, neighbors, and fellow theater goers for refreshments your Host's backyard! Thanks to everyone who came out for the 2015 Tour! Check out these great short videos featuring the current production, "Stripe & Spot (learn to) Get Along"
Channel 12 Feature on the 2014 Tour! Here are some TV features about past Garage Tours! Channel 12 Feature on the 2013 Tour! Video Diary of the 2010 Tour! Video Diary of the 2011 Tour!